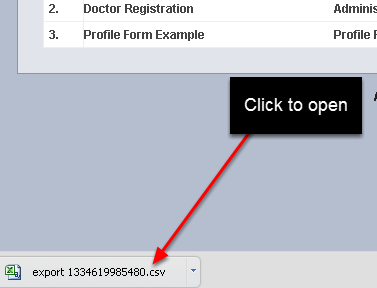 You can instantly generate a file of ALL Profile Data entered in the Profile Pages. If you are a coach or a staff member and you need a copy of this information you will need to ask you Site Builder. Athlete Profile Pages are used to store information about an athlete that you do not need to keep a track of changes of. It stores the latest information and this data can be pulled through into Event Forms or it can be set to show alongside Reports and Excel Reports. Previously, to get a list of any Profile Data entered for an athlete, you had to run a report on the Reports page and include the specific Profile Page in the report and then do an excel export. Zoom: Previously, to get a list of any Profile Data entered for an athlete, you had to run a report on the Reports page and include the specific Profile Page in the report and then do an excel export. To access a group of athletes' Profile Data, you had to go to the Reports Page, include a Profile page in a report and then the Profile fields that were set as summary fields would pull through into the Report. Then you could generate an Excel Report of this data. However, if an athlete did not have a record for the Event that you were running a Report for then the Profile Data would not be shown. Often you had to enter in a group entry for all of the players you wanted to run a reports for before you could generate a complete list of all of the Profile Data. This workflow was time consuming and prone to issues. Now, your Builder you can go directly to the Profile Pages on the Builder Site and click on "Download Report" for the Profile information that you require. A .csv file download will appear in your downloads directory. Builder's, if you are generating this list for a coach or administrator please ensure that the users receiving this file have clearance to view the athlete's data in this file. The download generates the profile data for ALL of the users with that Profile Data!